Chrystia Freeland and Ildefonso Guajardo Villarreal. As President Donal Trump says NAFTA talks are “doing very nicely,” negotiations between ministers from the United States, Mexico and Canada are ramping up in Washington in a redoubled push for a deal. 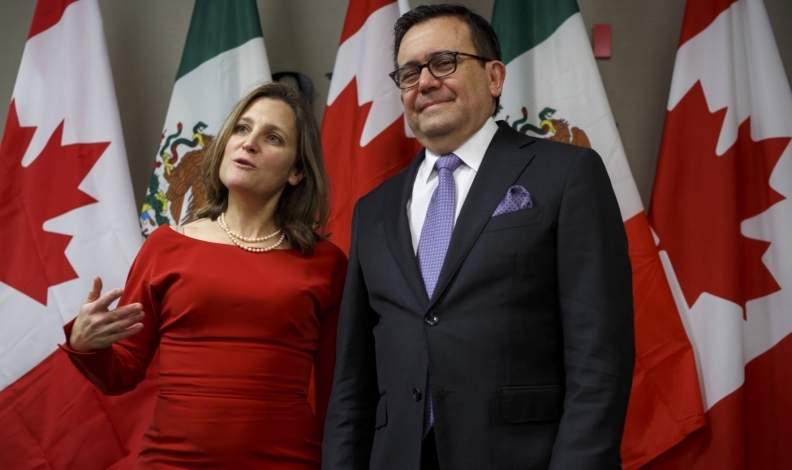 Mexican Economy Minister Ildefonso Guajardo and Canadian Foreign Affairs Minister Chrystia Freeland both attended meetings Tuesday at the U.S. Trade Representative’s Office in Washington. High-level meetings are expected to continue Wednesday and probably Thursday, according to an official familiar with talks, speaking on condition of anonymity. The push comes ahead of a U.S. trade mission to China, as Mexican and U.S. elections bear down. The sides have picked up the pace in recent weeks, though the goal is unclear. The United States has mused about a deal “in principle”; Mexico says it’s seeking a comprehensive agreement to update a 24-year-old deal. Meanwhile, Trump’s latest comments are a mixed signal, saying talks are going well but expressing concern about a quick deal. Under optimistic conditions, negotiators have a 75 per cent chance of reaching a deal soon, Moises Kalach, the trade head for the Mexican business chamber known as CCE, said in an interview Tuesday with Grupo Formula radio. An agreement on an updated North American Free Trade Agreement could be reached in the next 10 days, he said. Negotiating teams have agreed on nine or 10 more topic areas that are ready for ministers’ review and approval, Kalach said. Even so, wide differences remain on some of the toughest issues, such as tightening up the rules of origin for cars and their components, aimed at boosting American manufacturing but that could upend existing supply chains. Negotiators have also finished work on the telecommunications chapter, two people familiar with the talks said last week, asking not to be identified discussing private negotiations. Canada’s Freeland said Tuesday’s talks focused on automotive rules of origin -- a crucial sticking point, which she sees as the linchpin to a deal -- and noted that negotiators have been having constructive talks on the subject for some time, moved ahead in part due to some creative thinking put forward by the U.S. side last month. Trump’s negotiators have been pushing for a deal by early May. That would meet the U.S. timeline for having an agreement approved, at the latest, by the lame-duck session that will follow U.S. congressional elections on Nov. 6, said two people familiar with the negotiations. Guajardo said this month he sees an 80 per cent chance of an agreement by the first week of May. Negotiators are also rushing for a deal as Mexico approaches elections on July 1. Mexican left-wing presidential candidate Andres Manuel Lopez Obrador, who has stoked investor concern with talk of canceling an airport and slowing an oil-industry opening, has consistently led in polls. This week’s talks are set to cover the most ground since the final official negotiating round in Mexico City in early March, according to a preliminary agenda obtained by Bloomberg. Topics include automotive rules, agriculture, and legal and institutional matters such as dispute settlement mechanisms. In the spirit of what Guajardo has called a permanent round of negotiation, Freeland told reporters on Tuesday that "we are going to be working hard late into the night based on some of the issues, some of the points that were raised today, and we’ll be back at it tomorrow."